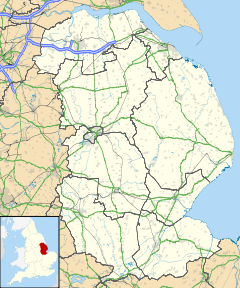 Alvingham is a village and civil parish in the East Lindsey district of Lincolnshire, England. It is situated 3 miles (5 km) north-east from the market town of Louth. The village is mentioned in the Domesday Book as "Aluingeham", meaning "Homestead of the Ælfingas (the tribe of Ælf)". It was the location of a Gilbertine Alvingham Priory until the dissolution of the monasteries. The 16th-century poet and translator Barnabe Googe inherited lands of the former Alvingham Priory after his father's death. In the west of the parish, the village borders Keddington. The parish boundary meets Brackenborough with Little Grimsby, east of Brackenborough Wood. Passing northwards, it meets Yarburgh, and crosses the Alvingham-Yarburgh road near Newholme. It follows Black Dike in a north-east direction, north of America Farm. Where it crosses the north-south Louth Canal, it briefly meets Grainthorpe. On Alvingham Fen it meets Conisholme and the Seven Towns North Eau, one of the constituents of the River Lud as it approaches the coast. Directly to the east is a large wind farm on Conisholme Fen. The boundary follows the Seven Towns North Eau southwards, to the west of Nunnitts Farm (outside the parish). It meets North Cockerington at the point the Seven Towns North Eau, Seven Towns South Eau, and Old Eau meet to form the River Lud. The river (and parish boundary) runs parallel, to the south, to the Louth Canal. The village contains two churches in the same churchyard, one, St Mary's, and now redundant, the other the only church in England to be dedicated to Saint Adelwold. St Adelwold (Alvingham with Yarburgh and North Cockerington) is in the Mid Marsh group of churches with Great Carlton, South Cockerington, and Grimoldby, and based in Grimoldby. The religious parish is larger than the civil parish, as it includes North Cockerington, a civil parish. The village has a Women's Institute and a farm shop. Alvingham Village Hall holds events for the village and the wider local area, including an 'Open Mic' night for musical talent. ^ "Parish population 2011". Retrieved 21 August 2015. ^ "Good Food TV Channel". Uktv.co.uk. Retrieved 2018-12-04.